Stop the bleeding!!! That is the first three things required to prevent unnecessary death before one can breathe a slight sigh of relief when moving the living casualty out of the immediate kill zone. If the victim is you and self-care worked – even better. 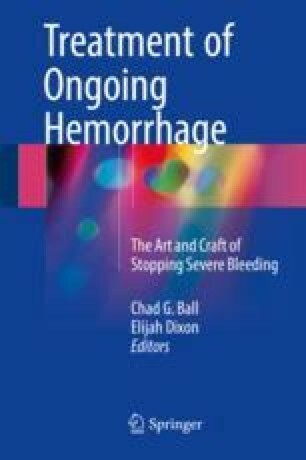 Hemorrhage control is the most critical thing prehospital that can be done for an injured person, and often simple interventions will suffice. It sounds simple, can be incredibly complex to the point of being elusive, but ultimately requires immediacy and the application of basics mostly involving fingers, with some potential adjuncts. Many people who die unnecessarily could thus be saved, especially in cases of extremity hemorrhage. If the bleeding is intracavitary, however, there are fewer prehospital options. Rescuers should not underestimate human physiology, however, which may allow survival via hemostatic reflexes. Fluid resuscitation to raise blood pressure when the bleeding cannot be addressed is unwarranted. If hemorrhage control cannot be offered, responders should not sabotage human survival reflexes with “non-therapeutics.” In the future technically advanced intracavitary rescue interventions may exist, but at present these are not “practical,” except for consideration in research or exceptional operational situations. St John AE, Wang X, Lim EB, Chien D, Stern SA, White NJ. Effects of rapid wound sealing on survival and blood loss in a swine model of lethal junctional arterial hemorrhage. J Trauma Acute Care Surg. 2015;79(2):256–62. doi: 10.1097/TA.0000000000000746.